welcome to the Railway Cottage in Glenbeigh - railway-cottage-ies Webseite! We would like to welcome you to our holiday home in Glenbeigh, Ireland, on the Wild Atlantic Way and the world famous Ring of Kerry. In 1890, this Railway Cottage was built as a milesman's house, and in the 1970s extended and 2015 renovated. Original elements such as the 60 cm thick stone wall in the entrance area, as well as the staircase, the doors and the wooden floor on the first floor, remained intact. The Glenbeigh Railway Cottage is idyllically located at the foot of Curra Mountain offering breathtaking views of Coolroe Mountain and the River Behy Valley. The country style kitchen provides all modern features like AGA cooker, dishwasher, fridge, freezer, microwave, toaster, water kettle, coffee machine. The living room has 4K smart TV and a XboxOneS with a selection of DVD’s and games. A small studio upstairs offers a lap-top table. Free Wi-Fi with high speed Internet is available throughout the cottage. The luxurious bath with marble tiles has an easy access shower on the first floor, a guest toilet and washing machine with a tumble dryer is located on the ground floor. Central gas heating. Cottage style wood stoves are to be found in the kitchen and living room. The Kerry Airport in Farranfore is 40 minutes drive away. You can reach cities like Killorglin in 12 minutes, Killarney in 25 and the touristy Dingle in 50 minutes. Glenbeigh and Killorglin have a variety of quaint pubs and well-stocked good restaurants. A variety of self-catering supermarkets are nearby. Glenbeigh, on the Wild Atlantic Way, can be reached in 2 minutes by car. Within a radius of 30 miles you can experience a variety of the famous sights of the Ring of Kerry. We recommend to drive the Ring of Skellig from Portemagee and visit the Kerry Cliffs. Also, the subtropical gardens of Kells Bay with their fern trees can be reached in 10 minutes by car. One of these fascinating trees can also be found in the garden of Railway Cottage. For hiking enthusiasts, the Kerry Walk Way leads right along the property. The nearby Behy River offers ideal opportunities for anglers and fly fishermen (a range of rubber boots is available for you). 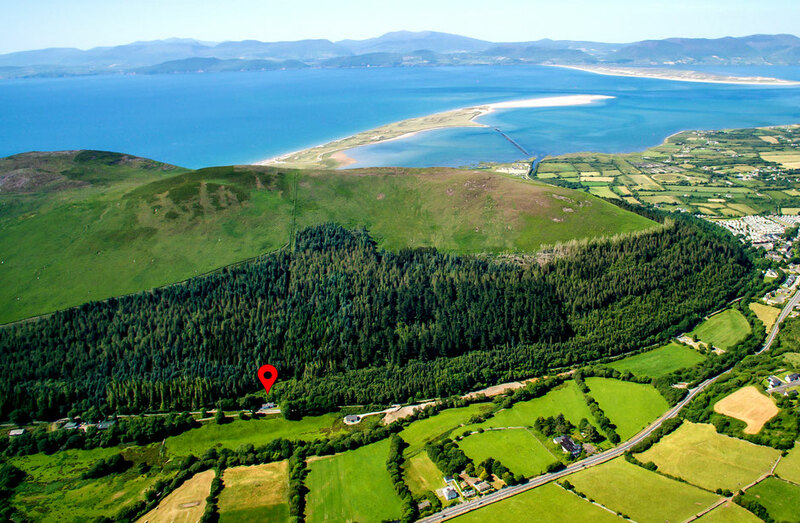 The Rossbeigh Beach can be reached in 3 minutes by car and promises you an endless beach with dunes for long walks, as well as sporting activities such as horseback riding, kayaking, surfing or stand-up paddling. A hidden gem is the Dooks Golf Club on the neighboring Cromane Beach.